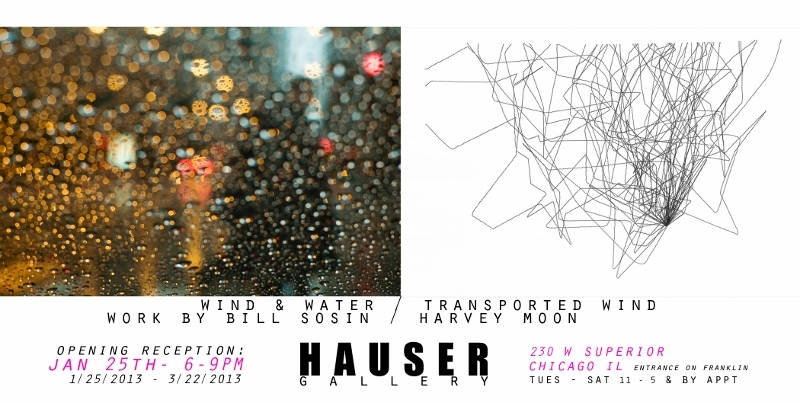 JANUARY 25TH, 2013/CHICAGO, IL: HAUSER Gallery is honored to present two concurrent exhibitions, Wind & Water by Bill Sosin, and Transported Wind by Harvey Moon. Sosin's work concerns the inescapable influence of the elements with a cinematic sense of discovery and vulnerability. The photographs literally blur the lines between water and glass, and bring into discussion the relationship between our perspective and nature. Transported Wind features Harvey Moon's drawing machine and respective prints which depict wind patterns as they occur. Needless to say, Moon's work divulges into man's relationship with technology, and invites us to ask how technology effects our aesthetic understanding.